Enjoy a day out aboard one of our day hire boats. 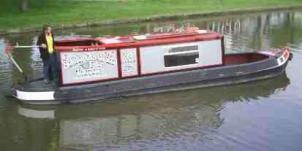 Our day boats are all similar semi traditional style narrow boats, 32 foot long by 6 foot 10 inches wide and powered by smooth running modern diesel engines and carry maximum of ten people. They are designed with enclosed seating in the main saloon and also outside seating in the forward well deck. Our day boats are suitable for all ages and dogs are welcome to join you for the day. When making your booking order your breakfast at the same time! Bacon or sausage sandwiches freshly prepared for you to take aboard with a tea or coffee. Buffet service available upon request. 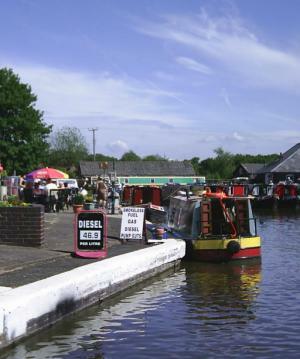 Get the taste of cruising on a narrowboat. Enjoy upto a 17 mile pound with no locks and upto 6 pubs! Hire period: 9.00am to 4.30pm. The kitchens are set up with hob, pans and kettle and has sufficient plates, mugs and cutlery for the boat’s passengers. There is hot and cold water and a fresh water flush toilet. Last hot food orders 4pm. Book your 2019 narrow boat holiday Click here. Life jackets are available on request. Please note that there is limited car parking at Norbury Junction. We request that wherever possible customers on our dayboats share cars to eliminate overcrowding in the area. Please park between the sleepers on the "road-side" of our main building or as directed by a member of staff. Please speak to a member of staff on reception if you are unsure and you will be directed to a suitable car parking space. Many thanks for your co-operation. You can now download a map showing the route that the dayboats can take. Alternatively you can contact our booking team by telephone on 01785 284292 or complete the contact form below. the day of hire in the same condition as it was collected with all of it's inventory and equipment in place. Friendly and helpful when booking. Really enjoyable day out. Excellent day out, highly recommended! Clean, tidy and staff were really very friendly. Loved the boat tour. Thank you for a great day out. Excellent value for money. Read more testimonials about Norbury Wharf Limited here.